The problem that I have is related to using HighDPI monitor. In my case, 24" ultra hd monitor and interface scaling option 250% (windows). A lot of interface parts look really tiny and are difficult to use because of this. And it's difficult to read labels there as well. Screenshot with an example of the problems is here: https://i.imgur.com/vLwlxtg.png. Run the main menu's File -> Preferences/Language to bring up the configuration screen. 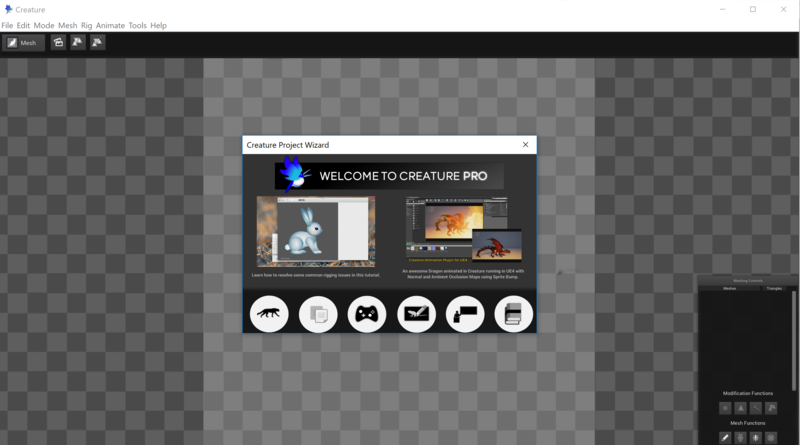 Drag up the Dark Theme UI Size slider, close the window and restart Creature. Thank you. I'm sorry that I didn't notice this option before. Some elements seem to be unaffected by this setting. And some text fields have correct text size, but themselves are too small to display it. For example, here is spline editor: https://i.imgur.com/jubaOeg.png Especially, the current value field at bottom left. The next upcoming update actually includes a lot more DPI sizing fixes for additional elements. Thank you for the update, it's much better now. Main panel is fine. There are still some problems in Animation Data though. In case you view this picture on FullHD monitor, scale the image to 50% and you'll get what I see in terms of sizes.